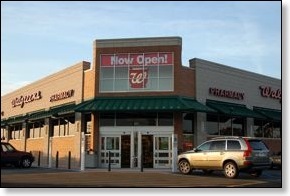 We were all hoping that it did not take as long to open the Cape Carteret Walgreens as it did the one in Swansboro. Fortunately that turned out to be case. It quietly opened around May 21. It certainly is nice to have a drug store right in Cape Carteret. It's a good gas saving measure. The holiday passed without too much excitement unless you tried to go buy groceries. We made the mistake of going to the Emerald Isle Food Lion last Thursday morning. It was like Thanksgiving. After that we stay away from the island until about 4 pm each day. 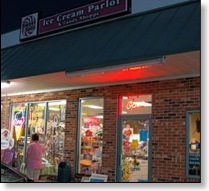 We did get over to the Sweet Spot, our favorite ice shop, on Memorial Day evening. The ladies said that the day had been busy. We got to see their ice sculpture before it melted away. Of course we also enjoyed some great ice cream. From all indications the Memorial Day weekend was a very successful kick off to the tourist season. I can even take the sprinkles of rain that we are getting today, since the forecast looks pretty good for the next couple of weeks. I keep the beach pictures close to my heart so a little rain isn't going to bother me. Saturday afteroon we were driving down to capture some shrimp at Captain Sams. 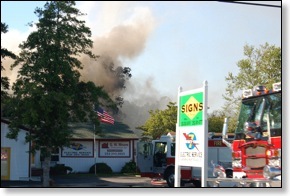 We were almost there when we saw some black smoke coming from behind some buildings. 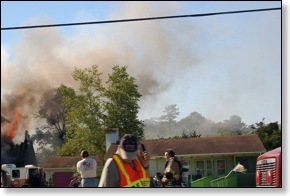 I looked in my rear view mirror and in the distance I could see fire trucks approaching. I wisely kept moving and focused on the shrimp and let the professionals go to work. While we were buying the shrimp, the Swansboro department joined the battle. By the time we drove back by and snapped these pictures, even the Stella truck was there. I haven't heard any details, but I hope no one was hurt. When we went back by the fire, traffic going westbound on Highway 24 was stopped and backed up past the intersection with Route 58. 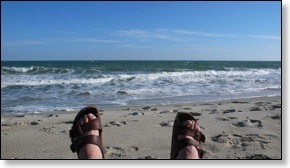 We headed on over to Emerald Isle and down to one of our favorite beaches to check and see if our beach chairs were working okay. You don't want to have equipment malfunctions in the middle of beach season. 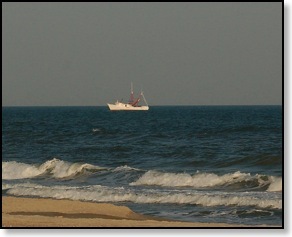 The winds were a little too persistent for our tastes over on the beach so we did not stay long. I still got to cool my heels a little. After the wonderful couple of hours we had on the beach on last Thursday, it is hard to settle for anything less. That day was so good that I wrote about it in a post, Practicing my chapel skills and posted a set of web slides. I am looking forward to some warmer weather and quieter winds next week. At least that's what Weatherunderground is promising. Farm fresh eggs just happen to one of my favorite foods. When we lived on our farm in Canada, we had own hens. My Aunt Molly got some "biddies" each spring. She always supplied my Mother with wonderful eggs. Having a flock of hens is an old southern tradition. Since we have moved to the coast on the western side of Carteret County, we have been looking for a source of fresh eggs. Not long ago my wife and oldest daughter discovered the White House at 3346 Freedom Way (Highway 24) in Hubert, NC not far from Swansboro. On Friday we took a trip over so I could meet the hens. I have never seen happier hens. 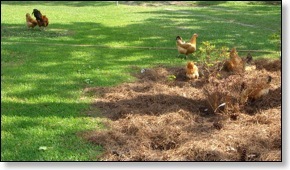 I had no idea that pine straw is the ultimate scratching material for hens. We took home lots of beautiful eggs. They are as nice as the Malu Aina Farm eggs that we used to enjoy in Roanoke with our perfect Saturday morning breakfast. I never made it inside to see all the neat decorative items for beach homes that I suspect is the real business of the White House. I stayed outside and watched the hens who are far more entertainment than television. All I can say is that if the decorative items are as high quality as the eggs, they must be very good.